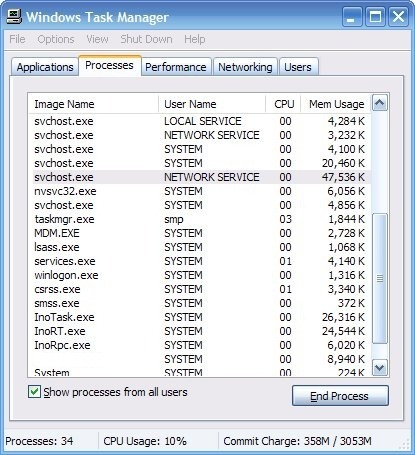 SVCHOST.EXE Application Error 0XC00000FD 0X76A9F4F9 100% CPU Resolved! For the past six months, I have encountered an error that occurs randomly only on one workstation. I have not found a solution on any website. In fact, Google 0xc00000fd 0x76a9f4f9 and there are only two websites that have even encountered this exact same message. Again with no solution until now. Well, a solution that works for me and hopefully a resolution for someone else. The quick answer: Rename nvsvc32.exe (NVIDIA Driver Helper Service) to nvsvc32.exe.old so that it doesn’t execute at startup. To read the reason for this answer read on. I couldn’t be certain if it was a Microsoft update, application installation, hardware change, driver update, pest, or malformed or malicious code. After using MSCONFIG to remove unneeded garbage from starting, I still encountered this popup error. I went as far as wipe the hard drive, rebuild the OS, and reinstall only essential software. Within 24 hours of the rebuild, the same Application Error occurred. 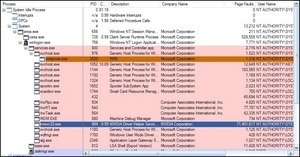 The exception unknown software exception (0xc00000fd) occurred in the application at location 0x76a9f4f9. Click on OK to terminate the program. 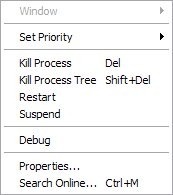 Click on cancel to debug the program. When the Application Error occurs and you press OK. The system immediately begins the System Shutdown. 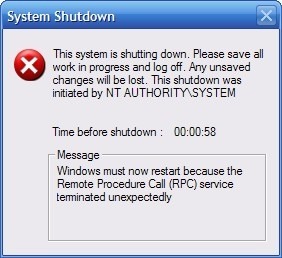 You can cancel the System Shutdown with the following command shutdown -a at the command prompt. This, however, will leave the system in an unstable state, where a reboot will become immanent within the near future. 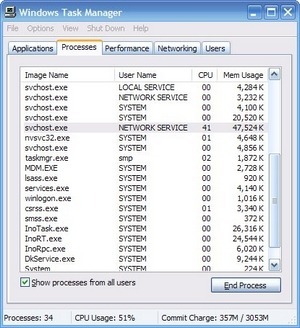 This screen shot of the Windows Task Manager shows the svchost.exe in action. It will peak at 100% CPU and has taken as much as 300,000 K of Mem Usage. 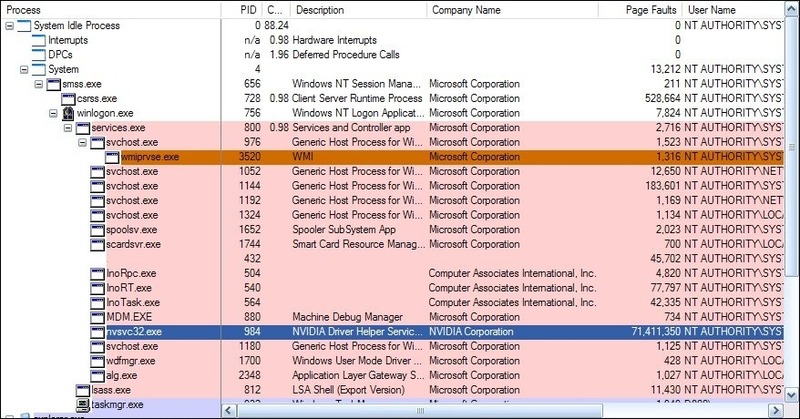 I immediately noted that the svchost.exe is using 40.20 CPU and the NVIDIA Driver Helper Service is using 1.96 CPU, which doesn’t seem to mean anything, however, it the CPU usage for the NVIDIA Driver Helper Service fluctuated as did the svchost.exe. This goes back to the age old question, what does the NVIDIA Driver Helper Service actually do? I suspended it by right clicking on the service and selecting Suspend. I moved the columns around a little bit to show that the NVIDIA Driver Helper Service has 71,411,350 page faults in less than 24 hours. 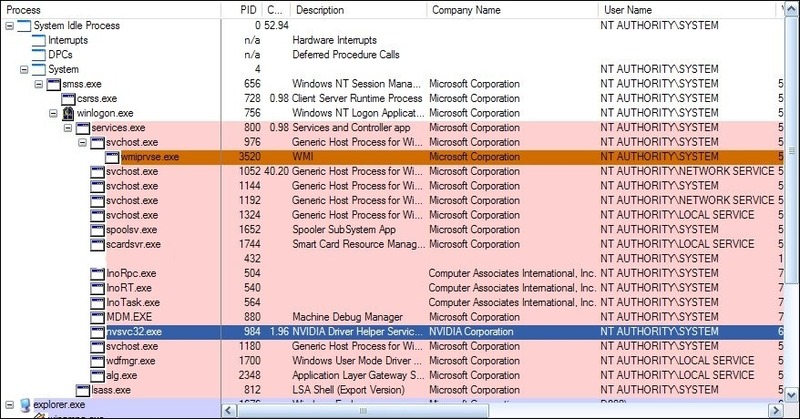 After suspending the service, notice that there is no CPU utilitization for either the NVIDIA Driver Helper Service or the svchost.exe. Windows Task Manager shows svchost.exe using 00 CPU and moderate memory. I went to C:\Windows\System32\nvsvc32.exe and renamed it to nvsvc32.exe.old, then rebooted the workstation. I have been monitoring the workstation for nearly 24 hours and the svchost.exe has not utilitized any CPU and the Mem Usage is acceptable. As for the video of the workstation, it does not seem effected by the renaming of the NVIDIA Driver Helper Service. I don’t know what it does, and judging from my reading no one else seems to either; however, removing it from the equation has resolved this error on this workstation. 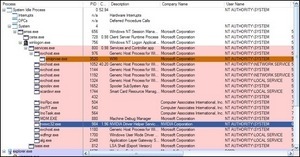 Update: June 28, 2008 – After two months, I have not had to reboot the workstation as a result of a SVCHOST.EXE error.Â Renaming or deleting the NVIDIA Driver Helper Service is the fix in this scenario.